Price Reduced plus Save 15-30% when you buy 2 or more! NO MORE PEELING, YELLOWING OR CHIPPING FOR UP TO 10 YEARS! PROTECT YOUR WORK FROM RUST! 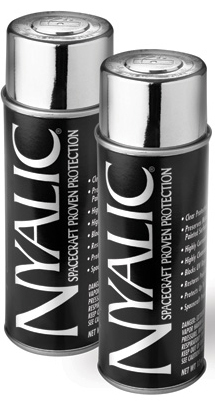 Nyalic® is a clear polymeric plastic resin coating that protects against chemical and environmental corrosion on ferrous and non-ferrous metals, galvanized, anodized and powder coated surfaces, as well as restores oxidized painted surfaces. Coverage up to 95'! Watch how to use it!